Embargoed for November 15, 2018– Oklahoma City – OKC Metro Alliance broke ground on a new apartment complex in South Oklahoma City this week. Over 100 people attended the event. The Alliance is expanding its Men’s facility by constructing twenty (20) units of single room occupancy transitional housing and making other improvements related to the housing. The project is funded through several federal grants awarded by the City of Oklahoma City and the Oklahoma Housing Finance Agency. The U.S. Department of Housing and Urban Development is the federal funding agency. Inasmuch, Dolese, and the E.L & Thelma Gaylord Foundation have contributed to the project with private donations. Diversified Construction of Oklahoma is the General Contractor. OHFA provided a grant of $1 million through the National Housing Trust Fund. $300,000 in CITYadministered HOME funds is allocated to new housing construction while $157,000 of CDBG funds is allocated to eligible activities that do not directly subsidize or assist new residential construction, per 24 CFR 570.207(b)(3), but rather support the housing project with site improvements, parking, and sidewalks. An additional $193,000 of CDBG has been allocated by the CITY to assist OCWUT in moving the Men’s Firstep campus off of an outdated sewer lagoon, which had become an EPA concern, to a new lift station and force main line that connect to the CITY’s public sewage system. FIRSTEP programs are long-term residential work training recovery programs that help men and women conquer alcohol and substance abuse. Since these issues can affect anyone, Firstep programs assist individuals from every social class, gender and race. 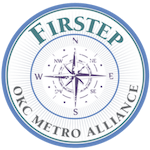 To learn more about the OKC Metro Alliance, visit www.okcmetroalliance.com, call (405) 232-1864 or email c.schlittler@okcmetroalliance.com.